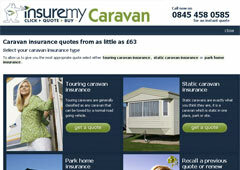 Insuremycaravan.co.uk is one of the UK’s fastest growing comparison sites for caravan Insurance. Using 3 of the UK’s major caravan Insurers we will provide you with a choice of policies for over 90 makes of caravans to ensure that you have the cover you require instantly. As well as the standard cover you would expect from a caravan policy we are also able to provide you with additional benefits. Up to 25% discount for an approved tracker. Insuremycaravan.co.uk offers competitive static caravan Insurance rates for holiday static caravans, instantly online and should you have any questions you can contact a member of our knowledgeable caravan team who will only be too pleased to help. loss or damage caused by fire, storm, flood, theft, vandalism, falling trees and impact by road vehicles and optional Malicious damage cover. Accidental damage to sanitary fittings, glass panels, TV’s, Video, audio and computer equipment. Discounts for caravans less than 5 years old. Insuremycaravan.co.uk are able to offer bespoke Motor home insurance through one of the UK’s leading Insurers, and as we want to ensure that we are provide you with a quote that will best suit your holidaying needs we will need to call you back with a tailored premium.